Selfys Clothing Unlimited is wearable, modern fashion at the best possible price and this store in Crosspoint Mall is currently offering a 50% discount! Selfys gives you Forever 21-esque clothing at less than half the price. From boho chic, to partying hard, and family dinners to work wear, this place has got something for everything. Whether you forever favour black, or change colours with each passing season, you can find something cute and unique to suit you. Started by a local designer, the shop stays up-to-date when it comes to fashion, keeping in mind all your limitations, and creates fun, classy and edgy clothing. The best news is that the shop is on sale. Most of the items are 50% off, which makes them a total steal! 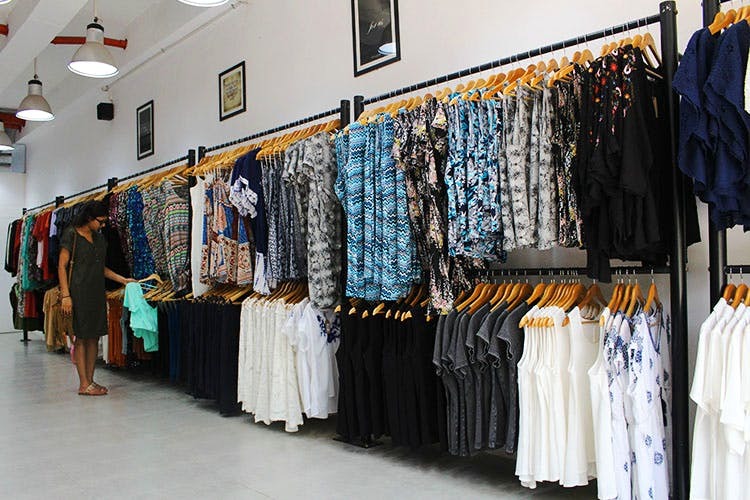 Modern styles and great quality will make you ditch the expensive malls or the cheap Sarojini shopping and bring you the perfect balance of beautiful and thrifty. Their only physical store is tucked in the ground floor of Cross Point Mall, however they do have an online presence. You can check out their collections and even pick up some stuff on sale and have it delivered to your doorstep.Though as is with books and movies, the physical store does seem better. You can check out their online store here or get updates on their Facebook page here. If you want to slay at a party, you don’t have to murder your piggy bank. Check out the current styles and fun prints at Selfys.